On December 10, we attended our second qualifier of the year at the PlaySpace. We would like to first thank WeLovePi for hosting this event. At this qualifier, we were ecstatic to receive 1rst Place Inspire Award, Control Award, and Finalist Alliance Captain. In addition to this, we were nominees for every award, including receiving 2nd place Connect, 3rd Place Motivate, 2nd Place Design, and more. We would like to thank team GOATS for being a great Alliance partner. 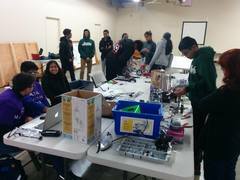 On December 4th we participated in the first San Jose Qualifier. We were able to press the beacons in the tele-operated period, and reliably score the cap ball in endgame. Because of this, we were 3rd seed at the end of qualifying matches, and with the help of team 4998, Q, we won winning alliance, 1st pick. 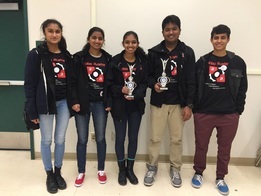 We also won the 2nd place Inspire Award, and thus qualified for the NorCal regionals. Since then, we've been preparing for our second qualifier, San Jose 2.
motivate award at auburn qualifier! We experienced many ups and downs at the Auburn Qualifier on January 30th. Having made many changes to our robot since the last time we competed, we ended up in 14th place out of 15 teams after the qualifying matches. However, we were honored to win the Motivate Award and to be nominated for the Connect Award and the Think Award! Thank you to FTC Team 8909 for hosting the qualifier! We would also like to congratulate our friends FTC Team 5353: Pink Fruffy Unicorns for winning the Inspire Award and our wonderful mentees FTC Team 9914: RoboWarriors for winning the Judge's Award! last qualifier of the season! Catch us at the Auburn Qualifier in Forest Lake Christian School on January 30! At the Fremont Qualifier, we succeeded in qualifying to Regionals! Our robot landed us in 4th place after the qualifying matches. After teaming up with the 1st seeded team, FTC Team 5353: Pink Fruffy Unicorns, we were able to make it to the final match. In the end, we won awards for Finalist Alliance and 1st Place Inspire! Thank you to FTC Team 548: Geek Squad for hosting the qualifier and FTC Team 5353: Pink Fruffy Unicorns for being an awesome alliance captain! We're looking forward to competing again at NorCal! 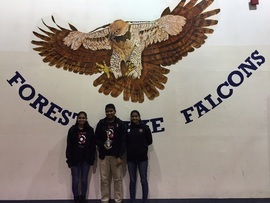 Our team will be participating at the Fremont Qualifier in Mission San Jose High School on December 19. Hope to finally start the season!!! Our team will be participating in the Play Space #1 Qualifier on November 8. Hope to have a great start to the season! This qualifier was cancelled due to low team sign ups, however a scrimmage was held at the Play Space during that time. Every year, our team needs to purchase new parts, pay registration fees, and cover travel expenses. Any donation will be graciously accepted.